When you are looking to stray from the ruckus of Front Beach, make your way to Finn’s Island Style. Aside from the allusion to their shark fin logo, Finn’s is named after the owners’, Justin and Kim Buxton, son Finn. So, what is Finn’s all about? We caught up with Joe, a long time employee at Finn’s. “Justin and Karen Buxton come from the surfing world,” Joe says. “So, staying healthy and active is a way of life”. Alright, we get it. You’re on vacation and eating healthy food isn’t necessarily at the top of your list. But before you give up on Finn’s, just know that they are packing some serious flavor into their food. If you had to pick only one thing from Finn’s, it would have to be the fresh Fish Tacos. 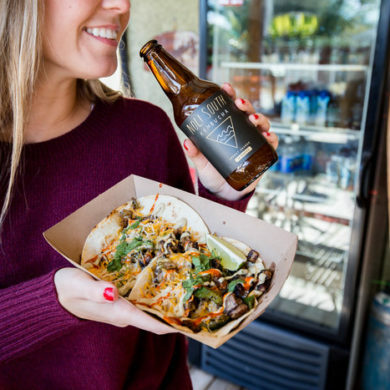 These mouthwatering tacos come loaded with grilled mahi-mahi, cabbage, pico, cheese, cilantro, Valentina and white sauce — hold my kombucha. Speaking of kombucha, Finn’s is serving the fermented fizzy stuff. But this isn’t just any kombucha — Noli South Kombucha was founded and bottled right here in Panama City Beach. With flavors like blueberry lemon, hibiscus grape and ginger lime, you won’t be able to stop sipping. Finn’s has plenty of space to stretch out and relax outdoors with your meal inside Little Village. If you aren’t familiar with Little Village, check out our blog! Kick back and enjoy the slower side of Panama City at Finn’s Island Style. Finn’s Island Style is located at 2808 West 12th Street, Panama City, FL. For more information or to see a menu, visit the Finn’s Island Style website or call (850) 215-9273.